Sukhoi Civil Aircraft, maker of the Superjet airliner, has signed a letter of intent with India's Aviotech for the supply of ten Sukhoi Business Jets (SBJ), the VIP version of its Superjet aircraft, Sukhoi President Vladimir Prisyazhnyuk said. The agreement included options for another ten planes, Prisyazhnyuk said. 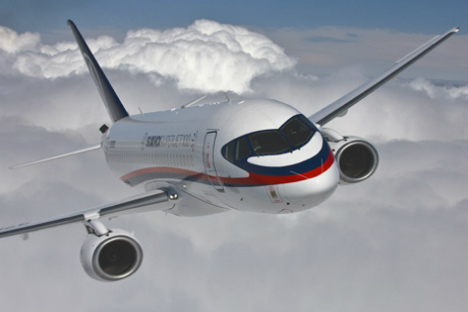 The Sukhoi Superjet 100 is a joint venture of Russia's Sukhoi and Italy's Alenia Aeronautica. The passenger aircraft is being produced in three seating classes. The aircraft will have a range of nearly 8,000 kilometers with additional fuel tanks in the cargo compartment. It will carry passengers on long routes like from Paris to New York. Several airliner manufacturers have developed VIP versions of small airliners, including the Ukrainian An-158 and the U.S. Boeing 737 BBJ.